Well, it’s finally here … the first week of Tutorials for the 2013 Friesen Project. Are you excited? I know that I am! After last week’s Friesen Friday and reading your book, some of you just couldn’t wait to dive right in and have already created your dragon. That’s fine, no big deal! But throughout this month there will be several different “specific components” you are going to need to work on for each project. Without any further ado however, let’s get started! PLEASE NOTE: In order to do this dragon tutorial, you will need Christi Friesen’s Dragon book that is available for purchase here. Due to copyright, exact details and process have been minimalized to protect Christi’s art and design. Polymer clay is the most shared community in the world, please do not ruin that by going against US copyright laws. Since the start of this month, I have been thinking, dreaming, and claying away dragons. So…I will only feature two of those dragons today (using both for the tutorial). As per the announcement last week, your project for this week will be to create your own Wendyll dragon. My first dragon is the one pictured above. I named him Pumper … but I gave it to my hubby for Christmas and he renamed him to “Alfred” … even though he said it looked like a girl dragon. Which, she/he/it does look like that I guess. But today, “Alfred” will be the start of the show…. moving on! The dragon at left is the forth dragon I created, he’s much smaller and has a simpler overall look … his name is “Monty.” He might be my favorite thus far, mostly because he’s cute and little with a GIANT bicone eye! But I digress … It’s time to get started and create your own dragon from Christi’s inspiration, book, and my help too … let the Dragon Tutorial begin! In order to get started claying your best dragon ever, you will need a block of polymer clay. You can use the clay straight from the package, or create a mix with streaks, stripes, and character. The choice is yours. But the first thing that you will need to do is condition your clay. You are going to need about 1/2 a block of clay, or a “lump” about the size of a walnut. Or … if this is your first dragon ever, sometimes it’s easier to learn on something bigger and then go smaller. So go ahead and use the whole block if you want. Just know that your dragon will be supersized! And sometimes, supersized can be really fun. A dragon is up to interpretation on how you think if should look. However, since we are following Christi’s book, we want to make our own Wendyll dragons, so follow her basic shape on page 8 by smoothing, pinching, and creating a taper. You basically want a head, body, and tail. To do this, you will start with a ball, roll it to a pear, and stretch and shape it from there. You’ll notice my dragons body is small and his neck and head are big. (His tail was made longer after this picture was taken.) But before you do anything you need to decide what you will do with your creation as that will determine what he looks like. My dragon is going to be an ornament for my hubby (I gave it to him on Christmas day & he loved it!) so I wanted his neck to wrap around his body like he was peaking out from behind something. Now it’s time to put that sculpting to good use and create the parts of your dragon. You will need to shape your dragons head, the most important part. This is the part of your dragon that will set the “tone” of your sculpture. Your head could be pointy, elongated, smooshed flat on the nose, have a horn, or look “snubbed.” On page 11 in Christi’s book, she gives plenty of examples of possible dragon heads that you can look at to help create your own. When that is finished you want to move onto the tail. Don’t be afraid to make that dragon tail twist, curve, twirl, spin, or go right side up! Anything goes! Long tails, short tails, medium tails … whatever! Christi features over 12 different tail examples in her book on page 12-13, so use them as inspiration and a guide. When your tail is set the way you want it, it’s time to alter your body shape. Pinch up the back and make some wing pads for the wings to lay against (if you are not putting wings on your dragon, you may omit this step). And then do the final tilting, rotation, or placement of your dragon head (pages 14-15) . Now .. sit back and look at it. Do you like it? Is something off? Does something need fixed or reshaped. Do not go ANY further until you are happy with how your dragon looks. If you don’t like his basic shape now, you will not like it when it is finished either. So keep manipulating the clay until you are happy or think, “Gee, that looks like an awesome dragon-ista!” And, if you really aren’t happy … no biggie! Just squish, squash, and start all over! Now it’s time to add your wings! Personally, I happen to think that all dragons have wings, however, some people tend to not think so. Start with large teardrops and flatten with your fingers while giving a little curve on the end. If you have opted to not put any wings on your dragon, skip this step and go to the next one. Since this dragon is an ornament for my hubby, I placed a piece of wood between his wings to keep it open for a string when he was finished so he could hang on the tree. See pages 15-16 in Christi’s book for more details. Now add your eyes. Unless your dragon is sleeping, all dragons will need eyes, otherwise there’s no way he or she will ever be able to know where they are going. Look out for Zombie eyes, as Christi calls them! Dark eyes are good, light colored eyes look like you woke the dead. Remember when adding your eyes that there is a right and a wrong way to embed your beads into the clay. Please see this tutorial on embedding beads into polymer clay to properly insert beaded eyes into your sculpture. Now it’s time to add a little more life to your Dragon. Give your dragon some eye lids, in multiple colors, the same colors, new colors, whatever, be creative. Start with a small circle, roll into a tapered snake, and smoosh flatter. Then add “lines” to the eyelids, make them “bumpy” eyelids. It doesn’t matter. There are hundreds of expressions that you could use to give your dragon some personality. Think about what you want your dragon to convey. Is he mad, happy, sleepy, angry, or hungry? You can communicate those emotions in his eye lids. Try several “looks” to get it right. If you don’t like it, take it off your dragon and try again. See the book on pages 10-21 for eyelid demonstrations and some hilarity from Christi. And please, do not forget to give your dragon a nose … after all, he or she doesn’t have an allergy problem, or does it? You can tell that my green dragon is all stuffed up … no smelling for this dragon as alas, I forgot to give Monty a nose, poor guy! Christi will show you several “nose samples” so that you can give your dragon the perfect rhinoplasty (see page 21) – but remember that you can use any kind of nose that you find appealing! And the best part are the ears of course (see page 22-23 in Christi’s book)! Add some ears! Start with small circles, roll into teardrops, smoosh semi-flat, and then detail them. Your ears can be: pointy, elvish, stalky, feather like, huge, elephant-like … whatever you choose, but your dragon needs to have a way to hear, doesn’t he? Or is he just going to skulk around wondering what’s going on because he can’t hear … and then BOO, another dragon scares him. Don’t traumatize your dragon, give him ears! And now it’s time to add all that really cool brick-brack, fizzle-schnizzle, curls, twirls, rooster combs, whatever, you name it! Embed some beads in key places to give your figurine some character. Add bumps for texture if you’d like. Add curls, feathers, dots, swirls, pearls, rice-like bits, a hairdo … whatever you’d like … but get creative! Take a walk on the wild side and do something you wouldn’t normally do, that’s the point of this tutorial after all. You can use the same color clay, different colors of clay, create a blend, however you’d like. Don’t forget when embedding beads into clay, you must add clay over the bead to help hold it in place after baking. See Christi’s book on page 24-26 for lots of ideas and options that you might want to try. I made my dragon decor for “Alfred” really fancy with gemstones and a large Swarovski Crystal in his tail because he was a Christmas tree ornament. However, I made the decor for Monty much simpler and less detailed … why? Because I wanted to … that’s why. When you have decorated your entire dragon it’s time to bake him. Make sure you bake him at the recommended time & temperature for your brand of clay. “Alfred” baked for 50 minutes in my oven, while “Monty” baked for 35 minutes. Length of time to bake will largely depend on the overall “thickness” of your dragon. If you are afraid your dragon will burn or crack in your oven, try these helpful tips to prevent that from happening. There is a large amount of people that prefer the “raw” look to their clay pieces. If you like your dragon just like he is when you take him out of the oven, then you can skip this step. I personally like a little “oomph” when making a piece like these dragons. Just pick a color of acrylic paint that you like (I’ve linked a set with lots of color options for you). Arm yourself with your paint brush and sponge (or baby wipes … I prefer baby wipes). Then dab the paint all of your baked creation. Really shove it into the nooks and crannies. Then simply wipe away with a damp sponge or baby wipe. But be careful, don’t wipe too hard or you will take the paint out of the crannies and then the nooks will be lonely. So wipe gently please! Here are a few before and after pictures of Alfred. As you can see, he’s much more “defined” after he’s had a patina added to him. See Christi’s Dragon book on page 39 for more details. I then finish my dragons by adding a coat of Varathane Varnish. I use this because not only does it go on without bubbles, but it dries really fast compared to other finishes made by the polymer clay companies. This is what I personally recommend for all your polymer clay projects due to ease of use, lack of bubbles, and quick drying time. Likewise Christi recommends either Sculpey glaze or Varathane varnish. For more finishing details see page 39 in the Dragon tutorial book. 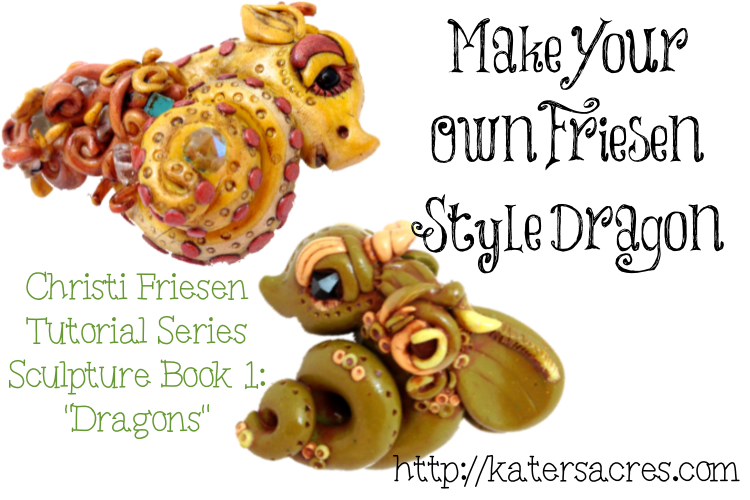 YOU HAVE NOW MADE YOUR FIRST CHRISTI FRIESEN INSPIRED DRAGON! Does the spray varathane varnish work as well as the brush on? Thanks! Generally any kind of sprayed varnish will react with the clay over time. PYM-II is the only spray varnish I am aware of that will not. Thanks so much, Katie!!! I’ll get some of the brush-on kind on my next outting. Thanks so much Katie!! !I do a lot of beading and have some Swarovski crystals in hand, will try them now. Great! Enjoy – let me know how it goes. Is it OK to bake the Polymer clay pieces with Swarovski or rhinestones (like when using them for eyes and crown). Thanks for stopping by San – Absolutely it is just fine to bake polyclay pieces with Swarovski crystals or rhinestones. Just be sure the materials you are using are safe to bake up to 275, all glass is fine to bake in the oven. Thanks for asking! I love Christie’s dragons. I seem to have joined as a “friend” not a member. Is there a difference? How can I upload my Wendyll dragon and read the blog? WHere are you trying to add your dragon? To the Pinterest page or to the Facebook page? This is so much fun. I can’t wait to see what the coming weeks bring. My Grandson who is 7 was here over Christmas break and we worked on Christi’s dragons. Together we made 2 of them. Mr. and Mrs. His decorations were a little different but all his. I will have to see if his Mom will take pictures and send them to me. I will be making on of my own this weekend. Can’t wait. I am a huge fan of Christi’s and yours. Thank you for bringing this wonderful opportunity to all of us. Almost finished with mine, thanks for helping me revisit some of these great books I’ve gathered! First claying I’ve done all year! Great job !!! You have a very Christi like way of writing instructions…..very easy to follow, but very entertaining at the same time. I want to go start sculpting right now!! Thanks so much! I’m glad you enjoyed the tutorial. I can’t wait to see what you make. Very cute with wonderful explanations. I, too, have found many of the ‘finishes’ to remain tacky far too long. The Varathane is best. I may actually be able to do this project this week. Crossing fingers! Oh Marianne I do hope so!!! I want to see what you make!